"The Men of St. Joseph is an association of Christian men, united under the Catholic Church, who meet weekly to pray together and encourage each other to be the spiritual leaders of their families. The purpose of the Men of St. Joseph is to instill holiness in men and facilitate spiritual leadership in family and community life." What a different world it would be if more men dedicated themselves to holiness and embraced their role as their family’s spiritual leader. What if your parish and community was full of men like this? We ask our men to help “put the family in the hands of the Father”. By this we mean the desire for men to lead by example and through that example help place himself, his family, his friends, and community into the hands of our Heavenly Father. In short, help lead those around him to holiness. Weekly meetings which consist of prayer, reading about the ultimate example of holy manliness in our Lord Jesus in the Gospel, and a discussion of the practical application of that example in today’s world. This weekly prescription help give men the tools, confidence, and support of other men, to become the spiritual leaders we are all called to be. 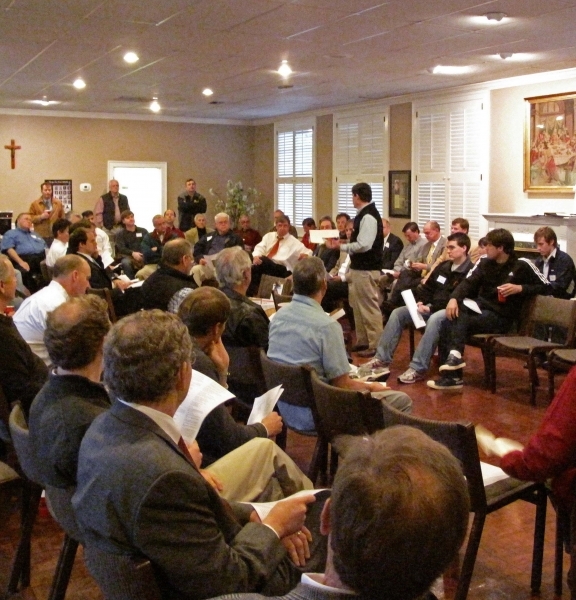 Our hope, is that participation in the Men of St. Joseph meetings will lead to invigorated spiritual lives of Catholic men, and by their positive influence, to that of our families, friends and co-workers.